Being the largest single trail system & one of three original HMT systems. (opened in October 2000) With over 100 miles of trails, Rockhouse Trail System offers a wide variety of trails at all difficulty levels. It is especially popular with riders who are looking for an “Extreme” riding experience. This trail system has direct access to the ATV-friendly towns of Man and Gilbert, WV. Each of these towns offer fuel, food and lodging, along with a generous helping of southern hospitality. Named Best Sandwiches in the Coal Fields by the Mingo Messenger – 2017 Placed 2nd in the West Virginia Fire & Ice Chili Cookoff – 2017 Nominated “Best BBQ” in WV Living Magazine’s Best of West Virginia Awards – 2017 Titled “The Most Mouth Watering BBQ In West Virginia” OnlyInYourStateWV – 2017 TripAdvisor Certificate of Excellence – 2018 Runner Up “Best BBQ” in WV Living Magazine’s Best of West Virginia Awards – 2018 Executive Chef: Karie Montogomery Located on site at Twin Hollow Campground and Cabins off Rt. 52 in Gilbert, WV & directly off the Rockhouse Trail System of the Hatfield McCoy Trails. Trail 12 BBQ offers 100% Hickory Smoked Baby Back Ribs & Pulled Pork, along with, Smoked Burgers, Smoked Bologna, Chicken. Specialty Hot Dogs & Much More. We also offer an array of appetizers, homemade sides, and deserts like our Homemade Blackberry and Peach Cobblers, Peanut Butter Pie, & our signature desert the “Coal Seam Brownie”. So, whether you’re looking for a place to slow down after a hard day’s ride, or just a pit stop before hitting the Trails stop by Trail 12 BBQ for some of the best food & BBQ in West Virginia. #WeStoleThePig #BBQWithAView Check us out on Facebook, Tripadvisor, & Yelp! https://www.facebook.com/trail12bbq/ Catering is available! Please call in advance. 2018...Only our 2nd FULL Season & we're going strong !!! Devil Anse ATV Resort, is located between Gilbert & Delbarton, just off Old US Hwy. 52. We are directly on the Devil Anse Trail, and are considered as being in the “sweet spot”, half way between the Buffalo Mountain & Rockhouse trail systems. Also, just 2.5 miles by road to the top of Horse Pen Mountain where the Marathon gas station is located. Our resort features 5 beautiful cabins and a luxury 40' camper plus 6 full hook-up rv sites (with easy access for longer RV’s) & tent sites. With more planned for the future. All cabins have gel memory foam mattresses & pillows. The cabins & rv sites all have free cable & wifi access too. Our property has a location for cell service too ! The sleeping capacities range from 6 or 4 persons in the cabins. Our cabins are gorgeous...all of them !!! Hatfield~McCoy Trail permits are also available at our resort for convenience, as well as Devil Anse ATV Resort & Hatfield~McCoy Trail souvenirs. We are the only retailer directly on our trail system ! As a matter of fact, we have a new building in the works which will house a new store/check-in area. Amenities include a bathhouse facility, grills, picnic tables, fire pits, gated security 24/7 at both our front entrance & at the Devil Anse trailhead connector, ice machine & firewood. We even have 4 restaurants that deliver to our resort. Our cabins have flat screen TV’s, UNLIMITED hot water for showers, fridge, microwave, stovetop burners, coffee machine and all your basic kitchen needs. Linens, blankets, pillows & bath towels are provided in all cabins. We are thrilled to be a part of the Hatfield~McCoy Trail system family & look forward to welcoming you as our guests to our “little slice of ATV heaven” at Devil Anse ATV Resort. Please visit our Facebook, Google & our website frequently to get a view of the fun we are having at our beautiful resort property. Remember to contact us for available bookings in this 2018 season. Happy trails, come check our resort out when you're riding even if you already have lodging for your present trip...maybe you'll think about staying with us on your next spectacular ATV vacation ! June's Place is a 3 bedroom 2 bath house that is located in the center of town. Our beds include 1 queen, 2 full, 2 twins, and 1 full futon. (plans are being made to add additional beds.) All linens and towels are provided. We also have a fully equipped kitchen, gas grill, fire pit (wood provided), and plenty of parking. The house is very spacious with 2 family rooms which include a large flat screen TV in each. Direct TV and free long distance calling are also provided. We are conveniently located to Hardess, McDonald's, Wise Guy Pizza, Foodland, Happy Days Diner, Gilbert Town Hall, Pharmacies, Speedway and the Pit Stop gas stations, the community center, Family Dollar, hardware and ATV parts stores, along with other businesses and restaurants. Trail entrance is just 1 mile (no trailering required). Give us a call. We're sure you will be pleased and will want to come back. Twisted Gun opened in the fall of 2002 with rave reviews. The links style course has four sets of tees and will challenge anyone from the novice to the seasoned professional. Come challenge your abilities on one of the state's finest golf courses. The 19th Hole Bar & Pizzeria is open to the public year around and serves great Italian dishes, along with the traditional bar food dishes and drinks. Are you looking for the greatest place in Southern West Virginia for four-wheeling, fishing and hunting? Check out our newly constructed cabins located just three miles north of Gilbert on Rt.80. This location offers easy access to the Hatfield-McCoy Trail System. You will be minutes away from local restaurants and entertainment. The cabins offer all the comforts of home, such as heating and air conditioning, fully equipped kitchen and full bath. We provide all linens needed. You will also have access to a coin-operated laundry. Each cabin has a porch with access to the river, its own charcoal grill and fire pit. When staying here, your backyard is the beautiful river. After a long day of riding the trails it would be a perfect place to just relax or fish. You never know, after staying here you may not ever want to leave "Wild and Wonderful West Virginia!" Nestled in the valley in the “ATV Friendly” Town of Gilbert which provides easy access to the nearest Trailhead, the Larry Joe Harless Community Center RV sites offer you a view of the mountains and the beautiful Gyandotte River. RV hook-ups are conveniently located on flat land and adjacent to the Community Center which offers indoor swimming, hot tub, sauna and café. The center also has indoor/outdoor basketball courts and tennis courts with a playground area for the family. Fishing and kayaking are popular activities along the Gyandotte River and we are located only 4 miles from R.D. Bailey Dam which features boat access. Fast Food restaurants, grocery store and convenience stores are all located within walking distance of the Larry Joe Harless Community Center RV sites. Call (304)664-2500 to book your reservation. Welcome to Movie Hut, your one stop shop for all things Hatfield-McCoy. Whether it's Trail souvenirs, trail passes, movie rentals, or lodging, the Movie Hut has it all. We have one of the largest selections of Hatfield-McCoy Trail T-shirts, hats, collectibles and more. We have a great selection of items to take back home to everyone in the family. We feature a full selection of new movie rentals and one of the largest selections of general movie titles in VHS as well as DVDs you'll find in West Virginia. Movie Hut also offers tanning and tanning supplies, scented candles, as well as snacks and soft drinks. Come check us out while you're in the area or visit us on the web at http://bigbearlodgewv.com/MovieHut.html. Big Bear Lodge, located in the beautiful ATV friendly town of Gilbert, WV, offers a private setting for our guests. The “Big Bear”, located on Guyan Street, is just 1 of the 4 properties that we offer in our peaceful little town. 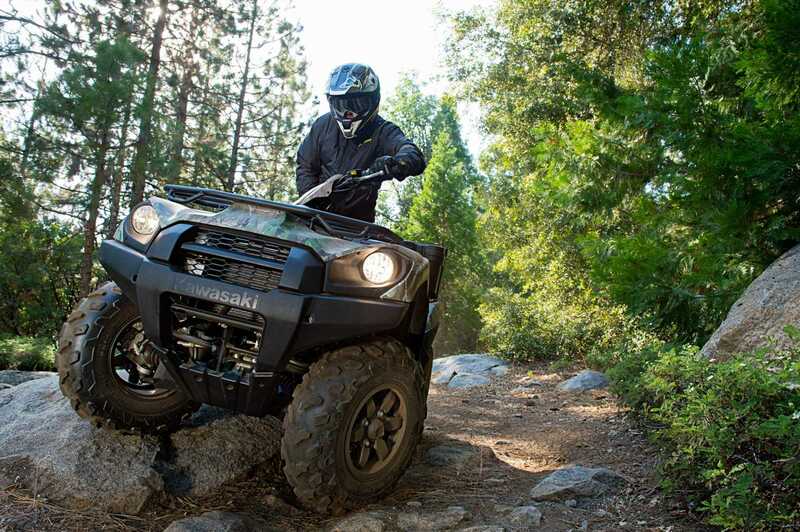 Once you arrive, you can park your vehicle and ride straight to the trails on your ATV, UTV, or dirt bike! You will have direct access to the Rockhouse Trail System as well as all the local businesses in town. You can ride in the city limits until 11pm, just be sure to be off the trail system by dark. Without having to rush or trailer your ride, you’ll have access to places to eat, fuel up, shop, and more. Be sure to stop by our very own video store, the Movie Hut, to check out the largest selection of Hatfield~ McCoy souvenirs in the State of West Virginia. Also, CLICK HERE to check out our NEW online store!! Three of our properties each have 9 individual beds, sleeper sofas, 2 full baths, satellite TV. All of our properties have full kitchens, coin-operated washer & dryers, gas grills, fire pit or chimnea, and plenty of parking. Our smallest unit has 4 individual beds, sleeper sofa, full kitchen, single bath, and a gas grill. Give us a call now at (304) 664-9516 or email us at moc.V1556087064Wegdo1556087064LraeB1556087064giB@o1556087064fni1556087064 and let us help make your trip to the Hatfield-McCoy Trails the “Adventure of a lifetime! !” We look forward to hosting your next group ride! The lodge is located at 315 1/2 Main Street Man, WV. It will sleep up to six people and has all the comforts of home which include: cable television, washer and dryer, all cooking utensils, dinnerware, towels, bed linens, stove, refrigerator, coffee pot, and microwave. All you need to supply is food and you can enjoy a cookout on the deck with the BBQ grill that is also supplied. You may also dine out at one of the local food establishments in the area. The lodge is located one mile from the Rockhouse Trailhead. The lodge has safe parking. In the early 1900s the railroad depot became the center of community life. This was particularly true in Mingo County, WV and the Matewan Depot became one of the most historically significant stations along the 673-mile Norfolk and Western main line. The facility was a combined passenger and freight depot that served the population of nearly 7,000 in Matewan and the surrounding area. After N&W-made its last stop in 1969, the once proud depot was closed and eventually fell into disrepair. In 2000 an initiative to rebuild the historic Matewan railroad depot began. It now serves as a welcoming visitor's center for the town of Matewan and a museum that includes information on the colorful history of the area including the Hatfield and McCoy feuds, the Matewan Massacre, and the development of the coal mining industry in the region. It also houses a gift shop which offers locally made arts & crafts, t-shirts, historical books, and Hatfield & McCoy Trail memorabilia. The 24 x 110 ft. reconstruction is an inch-for-inch, Smithsonian-quality representation of the steam era Matewan station. About me: LOCATION! LOCATION! LOCATION! Hawks Riverside Lodging is centrally located only a short ride from the Rockhouse trail head or the Town of Gilbert. No trailering to access the trail system, ride directly from the lodge on your atv,utv,or dirt bike! Want to just hang at the lodge? Enjoy a relaxing day on the porch watching and listening to the river flow by, keep your eyes open for our beautiful Blue Heron or the deer that frequent the area. Spend the day fishing the beautiful Guyandotte river who knows you may catch a nice small mouth bass or Catfish! Sit around the camp fire and enjoy the sounds of the stream. Now that sounds relaxing! Also nearby you'll find the Twisted Gun Golf course a true gem in the mountains! RD Bailey lake only about 30 min from the lodge provides plenty of oppurtunities to catch an array of fish(largemouth bass,catfish,stripers,smallmouth bass,crappie and many other of species live in the lake) the tailwaters are stocked with rainbow trout in the spring of the year! So come on down lets go riding in the mountains,fishing, or golfing! Or lets do all three! The lodge itself is very well equipped with a full size kitchen, heat pump, a maytag washer and dryer, full size bath and a spacious outside deck! Very private on the banks of the Guyandotte River. We have been getting reservations at a increasing rate and construction is finished on the second unit. Please feel free to leave all your comments. We will use these to provide the best facility and value on the Trail system. GIVE US A CALL, SEND US A COMMENT, OR CONTACT US BY EMAIL AT *protected email* and we will answer any questions you may have concerning your stay!!!!!!!!! 304-664-9709 PHONE RATES: FIRST 2/$100.00/$15.00 EXTRA PERSON. WINTER RATES DISCOUNT!!!!!!!!! 1/2 mile from the Gilbert Connector. We are located at Main Street, in the center of town, in Gilbert, WV. Ride your ATVs anywhere in town and directly to the Gilbert Connector. You will love our friendly town and our hospitality. Come sit by the creek and enjoy yourself. You can ride the new Devil Anse Trail to my great-great grandfather's grave site. You will love this trail and the historic adventure. You can visit the Hatfield McCoy Moonshine Distillery which is just minutes from our cabins. Pets are welcome if trained. We sell trail passes at any time. All linens and towels are provided as well as cable TV, fire pits, grills, heating and air conditioning. 24 hour Police protection. We have a 2 week cancellation policy. Close to Foodland and restaurants, Mexican Restaurant within walking distance. Vickers Rental / CaneBrake River Cabins offers a choice of (12) cabins/rentals, all in the town of Gilbert WV, nestled in a valley surrounded by majestic mountains and the Guyandotte River. This is the most perfect place to ride, play, relax, and enjoy the great outdoors. No trailering required; the entrance to the Hatfield~McCoy Rockhouse Trails (Trail #12) is about 100 yards from the CaneBrake River Cabins. Once you unload your ATVs or trail bikes, you don't have to load them back up until you are ready to go home! Getting here is easy too because you can pack light. Our rentals are modern, neat and clean and are well equipped with nearly all the necessities of home. You can find a check-list of amenities on our website www.rivercabinswv.com. All of the rentals have large, graveled, and level parking lots, so toy haulers, tall or long trailers, multiple trucks & vehicles, ATVs and bikes are no problem. If you have stayed with us before, we are looking forwarding to having you back and if you have never stayed with us before, we are looking forward to getting know you and share our slice of West Virginia heaven with you. Feel free to email, moc.l1556087064iamg@1556087064vwsni1556087064bacre1556087064vir1556087064 or call 304-785-1153, with any questions. A&G Lodging is located in the town of Gilbert, WV, home of the annual Trailfest Event. With access to the Rockhouse Trail System, you can ride your machine directly to the trails without having to trailer. The Rockhouse Trail also connects to the Devil Anse and Buffalo Mountain Trail Systems totaling over 300 miles of trails. Our rental can accommodate up to 12 guests and offers 4 bedrooms, 2 baths, full kitchen, washer/dryer, cable, WiFi, plenty of parking/carport, firepit, grill and more. Our nightly rate is $150 for the first 4 guests and $25 for each additional guest. 2 night minimum required. Call us today to book your stay! Also located onsite at Twin Hollow is Trail 12 BBQ. Open Daily 11:00am-9:00pm offering Hickory Smoked Baby Back Ribs, Pulled Pork, Smoked Chicken, Smoked Burgers, Specialty Hot Dogs and much more. Everything is homemade & all meats are seasoned with our secret recipe dry rub. Now open for Breakfast 7:00am-11:00am Friday, Saturdays, & Sundays and catering is also available! So whether you’re coming to hit the trails or just looking for a place to kick back, relax, and enjoy the southern atmosphere; come stay with us and find out truly why West Virginia is said to be almost heaven. Check out our website, like us on Facebook, & call for your reservations today! Twin Hollow’s Facebook: www.facebook.com/twinhollowcampgroundandcabins Trail 12 BBQ’s Facebook: www.facebook.com/trail12bbq Mountaintop Adventures’ Facebook : www.facebook.com/mountaintopadventures We hope to hear from Y’all Soon! Twin Hollow is an Authorized Vendor of the H&M Permits & Souvenirs! Twin Hollow is Locally Owed & Operated By The Ellis Family! The Gilbert Lodge has been completely remodeled. The newly remodeled lodge features 2 sets of Full over Full bunkbeds, a full bathroom, a refrigerator, and free cable, wifi and parking. Each room also has individual access to a Creekside Patio with Picnic tables and a lighted ceiling fan. We are located in the Town of Gilbert and have direct access to the Rockhouse Trail System. The Rockhouse Trail also connects to the Devil Anse and Buffalo Mountain Trails. The Home Place is your home away from home. Once you pull up to the property, you'll be greeted by a large front porch with seating. Inside, you'll find the original wood flooring that has been refinished. A large living room contains a couch, futon, rocking chair, and a Queen Anne chair. There is a 43" inch TV for viewing your favorite shows and sports while you're taking a break from riding the Hatfield-McCoy Trail System. The home is equipped with wireless internet, so you can be connected if needed. If not, please unplug it and enjoy a vacation free from your computer, cell phone, and tablet. There are 3 bedrooms -- two with full size beds and one with twin beds. Including the couch and futon, there is sleeping room for up to 8 people. The home has one bathroom with a full tub/shower. There is a dining room and fully equipped kitchen if you want to cook while you're here. There is a separate changing area, stand-up shower, and washer/dryer for you to change out of those muddy riding clothes before you enter the house. There is a separate parking area for your trailers and ATV's. This parking area is gated and is equipped with security cameras. There are 2 restaurants within walking distance and the closest trail head is Rockhouse. Please visit our website to check availability and book your reservation. We think you'll find the Home Place truly your home away from home!